Having an extra gasoline can is always a wise idea. Do not wait until you are stranded by the roadside for you to regret not owning one. You need a backup when setting out on your long-planned road. Ask lawnmowers and they will narrate how gas cans can turn out to be the nearest gas station. 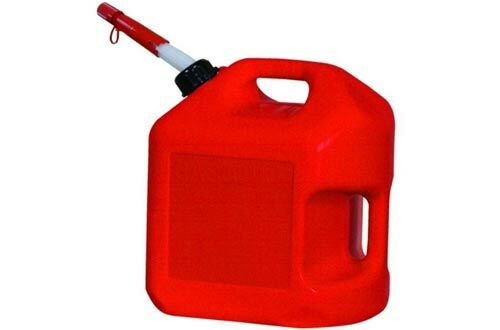 Gas cans are high-density polyethylene containers that provide safe storage for your gasoline. You can use them to quickly fill your car or any other machine. On the other hand, these cans come with pumps that can syphon if need be. If you are interested in one, you have to play your cards right in order to make the most out of your hard-earned bucks. After carrying a thorough research that involved testing, videography, and analysis, we finally came up with the Best Gas Cans. Check them out and grab your perfect fit. You can also read more about fuel transfer tanks. The galvanized Justrite 7250130 is a high-end product that goes beyond ordinary protection. Featuring lead-free steel construction, this gasoline can stands the test of time regardless of the level of abuse. It has reinforced ribs that keep the walls strong and prevents denting. Most prominent is the 24-gauze galvanized leak-proof positive relief lid that automatically vents. You don’t have to worry about spills or vapours when using this gas can. It is suitable for handling volatile fuels, solvents, and chemicals such as gasoline, diesel, kerosene and gas-oily mixtures. The ergonomic fill port plus the lift lever makes filling a breeze. Moreover, the safe-squeeze trigger lets you have control over the gas flow. Not to forget, you can also label the large ID Zone so as to prevent misuse. Flexible 9-inch spout prevents spills when filling equipment with small openings. More honourable is the fact the Justrite is OSHA & NFPA approved and also meets the CARB standards. 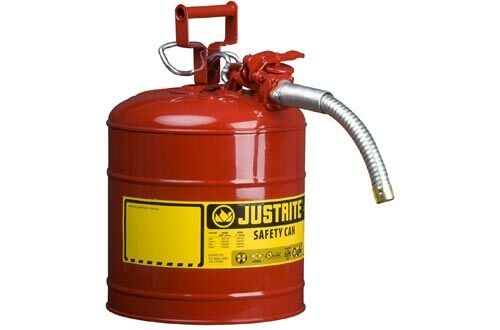 Hands down, Justrite 7250130 is a commercial-grade 5 gallons gas can that will take care of all your emergency and away-from-the-station needs. The Eagle Type I is a popular necessity among lawnmowers and vehicle owners. 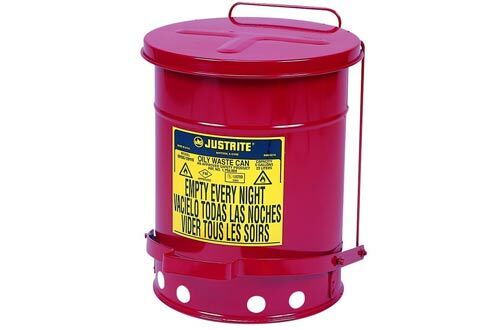 Featuring a seamless design and an adequate 5-gallon capacity, this gasoline can provide safe handling of all your flammable liquids. The lead-free galvanized steel construction plus the red baked powder coat finish makes this unit a durable and safe product. More incredible is the patented comfort grip trigger release that makes filling a snap. Other robust features of the Eagle UI-50-FS include the non-sparking flame arrestor, fixed ergonomic handle, and the spring closing lid. 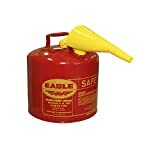 Apart from being 100% made in the USA, this gas can is NFPA and OSHA approved. Generally, anyone will find this gas can very useful. Justrite 7225120 is another prominent brand that boasts of excellent performance. 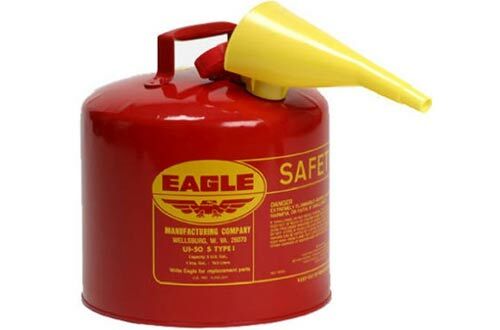 Built to NFPA and OSHA standards, this gas has 2.5 gallons capacity. 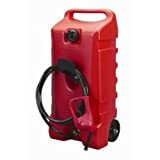 It is the ultimate solution for those who prioritize safety and convenience when dispensing gasoline and other flammable liquids. The offset fill port is ergonomically positioned to ease filling while the flexible metal hose enhances accuracy when reaching for small openings. You can always have control of every flow with the safe-squeeze trigger. Additionally, the large ID zone allows users to label this can and thus prevent misuse. Other prominent features include the self-closing lid that manages spills. 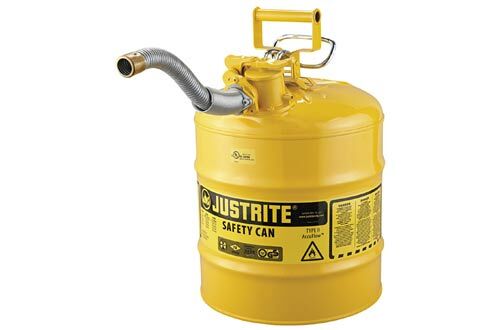 I personally believe that galvanized Justrite 7225120 is one of the best gas cans you can find in the market today. Try it out! Feel relieved with AccuFlow Justrite 7250230. Build to NFPA and OSHA merits, this can boast of several robust features to make your fuel handling safe and convenient. Stainless steel flame arrester prevents corrosion and dissipates heat to prevent sparkle ignition. Just like other Justrite brands, a large ID zone is incorporated into this unit to allow users to label the can. Self-closing lid automatically vents to prevent any possible explosion. 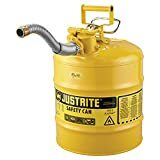 Any gas can enthusiast will appreciate the convenience of using Justrite 7250230 owing to its offset fill port plus the lift lever, both of which makes filling easy and quick. It is also possible to control fuel flow because of the safe-squeeze trigger. Highly recommend this safety can. No one wants to take risks when handling combustible adhesives. 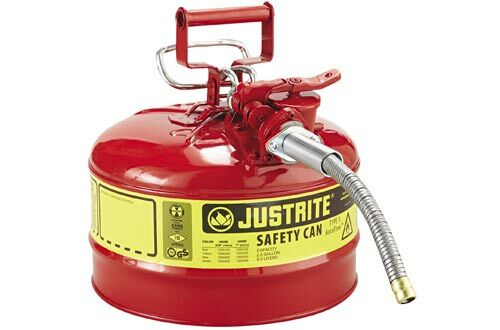 Fortunately, you can take care of such risks using the foot-operated Justrite J09100 Galvanized Steel Safety Can. 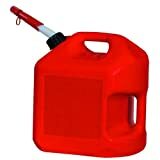 Designed with 6 gallons capacity, this gas will fully fill your lawnmower, car and other equipment. Unlike other cheap options, Justrite J09100 features a treadle-style pedal that makes opening a breeze. Another unique outstanding feature is the elevated bottom that allows free air circulation to enhance heat dissipation, reduce moisture buildup and rust. In order to prevent fire outbreaks, the lid is designed in such a way that it remains closed when not in use and doesn’t open more than 60 degrees. Other prominent features include the 6-gallon capacity, reinforced ribs, and the sold welds. It is ideal for use with thinners, linseed oil, solvents and other combustible adhesives. Overall, the J09100 Justrite is the perfect bang for the bucks! Clearly, DuraMax is a quality 14-gallon portable fuel container that will meet all your rural, farm and generator needs. Made of high-density polyethylene, this can is corrosion and dent resistant. You should expect convenient and safe storage of kerosene, diesel, and gasoline. This model boasts of a patented gas pump that keeps things in order in every filling. No spills! Unique safety shut-off valve system avoids leaks. Most importantly, DuraMax meets the UN and DOT requirement in regard to environmental protection. One of the most amazing features of this unit is the sturdy 6-inch wheels and the deep handle that eliminates the need for lifting this can when filling. Hands down, I wouldn’t recommend anything better if you want a gas can that delivers exceptional performance in recreational, commercial and industrial applications. 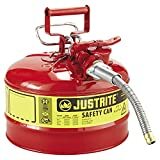 I highly recommend this rolling gas can for commercial landscaping, pressure washers, light equipment, and lawn tractors users. This is another outstanding product that is worth every single coin. Made of durable HDPE, Midwest 5600 can goes beyond safety and protection. Actually, it exceeds California Air Resource Board (CARB) and EPA standards. 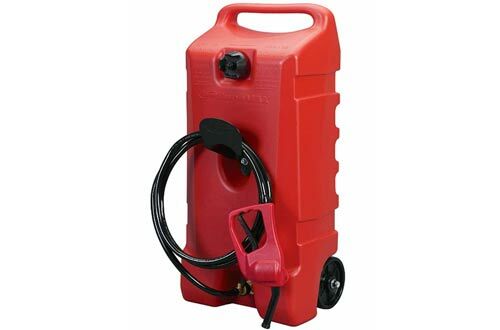 It is a great deal for those out there looking for a quality 5-gallon fuel container. Two ergonomic handles make filling a snap. It eliminates hydrocarbon emissions keeping the environment safe. Additionally, Midwest has a wide base and a lower COG so as to prevent any possible tipping over. Personally, I love this can for its amazing versatile features. Highly recommended! 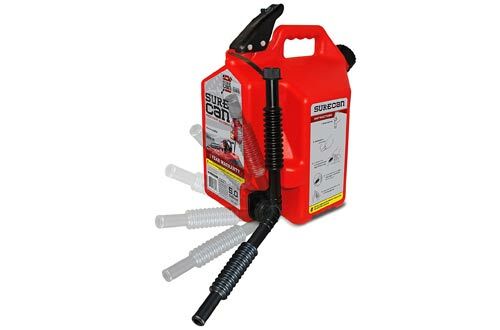 Hands down, SureCan is one of the most innovative gas cans ever invented. When you want to completely empty the can, you don’t have to tip it over. It features a prominent spill-proof technology and a rotating nozzle that makes your filling a breeze. Not to forget, it also has a thumb trigger that lets you control the flow of fuel to your own desired style. The design is quite appealing. Self-ventilation ability keeps the can content in the right state and eliminates glugging. Ergonomic and comfortable grip plus the rotating nozzle are major improvements worth mentioning. I highly recommend this can for the easiest, greenest and convenient fuel dispensing. Tired of losing so much gas with your poorly designed old gas can? Well, you can end all that with Midwest Model 5600 Gas Can. It provides convenient to fuel all your equipment while significantly reducing hydrocarbon emissions. It is made of HDPE making it a safe haven for all your gas and oil mixes, no rust, corrosion or dent! Designed with a capacity of 5 gallons, this unit makes the best choice when riding mowers and other equipment such as generators. It features a wide base and a lower COG so as to prevent accidental tipping over. More incredible is the spout that closes automatically keeping all the content completely sealed. Additionally, it has a convenient top handle that makes it easy to carry, turn sideways and pour when filling. Eagle UI-50-FS doesn’t just feature an appealing design but also boast of several prominent features. Hands down, this is a high-end model designed to end all your fuel handling troubles. It has a spring closing lid that prevents leaks. The comfort grip trigger makes it possible to conveniently regulate the flow of gas. To stand the test of time and withstand all sorts of abuse, this unit is made of hot-dipped galvanized 24-gauge steel. More robust is the non-sparking flame arrestor that prevents any ignition or fire outbreak. The high-quality USA made pour spout makes filling a breeze. Other honourable features that push this model up the ranks include the red-baked powder coating and the poly yellow funnel. Moreover, Eagle is UL & ULC listed. It is also FM approved and 100% leak-resistant. Overall, this is one of the best gas cans. When it comes to gas cans, there are plenty of options to go for. But due to the potential danger posed by gas fuels, you need to get the ideal model that performs best in terms of durability, performance, and safety. Various models have been introduced to provide a hassle-free way of storing and transporting gas fuel. However, from the hundreds of choices available, the following models have proven to be the best according to consumer reviews and ratings. Store your fuel in style with this classy can from Crown Automotive. The can comes in an attractive red color. It features a durable aluminum construction that can withstand any dents. The seams are fully welded to provide added strength. The can measures 18.9 x 14 x 7.1 inches. It has a large holding capacity of 5 gallons. A gasket is incorporated on the cap to provide a vapor-tight seal. The can have a flexible nozzle that allows for hassle-free pouring. This is a military-style gasoline tank. The tank is made of tough galvanized steel to eliminate any forms of corrosion. It has an overall dimension of 18 x 14 x 6.5 inches. This tank can comfortably hold 5.28 gallons of fuel. The cap features a latch mechanism that provides an air-tight seal. The tank comes with a flexible spout that prevents any mess during pouring. If size matters to you, then this is the ideal tank to go for. It comes in a cart style for easy mobility. The tank measures 15 x 15 x 31.5 inches. It has a 30-gallon fuel capacity. The tank is fitted with a dual-function rotary pump that serves to siphon and dispense fuel. The included fuel gauge allows you to monitor the level and makes refills when needed. The tank features 8-foot hose that provides extended use. This Jerry Can comes in a military green color. It features a rugged metallic construction that makes it tough enough for off-road use. The can has smooth edges and features a perfectly welded handle that won’t break loose. The interior is coated with a corrosion-free material for maximum performance. A gasket is incorporated on the mouth to render it leak-proof and airtight. The can holds 20 liters. This is a military-grade fuel can. It is made of heavy gauge steel and fully welded to provide maximum strength. The exterior and interior are coated with a corrosion-free material to guarantee maximum durability. This can is leak-proof and allows you to transport your fuel with confidence. It comes with a lockable spout for mess-free pouring. The can has a fuel capacity of 5.2 gallons. This can comes in a sophisticated design that comprises of two separate compartments. It features a 6-layer polyethylene construction that makes it totally impermeable to gas fumes. Its ergonomic handle is textured to provide a comfortable grip. The can provides a hassle-free thumb trigger fuel dispensation mechanism. With it, you have total control over the flow. This can has a 5-gallon capacity. 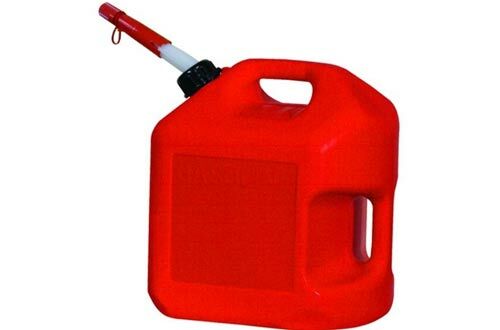 To the unfamiliar eyes, this may look like a typical fuel jug. But do not let the looks deceive you as this jug has much to offer, both in design and performance. It is made of the tough plastic material that renders it durable and corrosion-free. The exterior is calibrated to provide accurate measurement and excellent monitoring of the fuel level. The jug comes with a filler hose to provide a mess-free operation. This jug has a fuel capacity of 5 gallons.